Lizzie Howard is an ER doctor and loves what she does, but her father's death, her mother's Alzheimer's, and living up to the high standard of being Russ Howard's daughter has brought her to the edge of burnout, and a mistake in the ER. She's taken a leave of absence from the Springfield hospital, and has come to Jewell Cove to cover her friend Charlie's maternity leave. Josh Collins is still recovering from the death of his wife Erin, and the broken state of their marriage at the time of her death. He's feeling not just unloved but unlovable, burying himself in his work as Jewell Cove's doctor, and the last thing he wants is to get involved with the doctor who's filling in for Charlie. Both Josh and Lizzie are clear on just one thing: The last thing they want to do is get involved with each other. 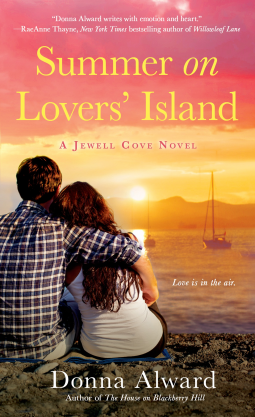 This is the third Jewell Cove novel, and we're revisiting old friends. Josh and his family and friends are back, and Charlie was the focus of the first one. Each of these is independent, but if you read them in sequence, the characters have a chance to grow and develop, and to be revealed slowly, as we discover people in real life. Jewell Cove is a warm and close-knit community, and the Maine, and New England, it exists in feel quite real. A very nice light read. Recommended.